Travelling is the next trendy way to flaunt your life and make people envious. There are travellers across the globe flooding your Instagram and giving you major travel goals. There are travellers on your friend list who keep changing their display picture. They give you a massive heart attack at the hill view of Maggie point in Dharmashala. They go LIVE from the cruise of Dubai and take you to the streets of Venice. Who doesn’t love to travel? Well, maybe some don’t love the life of travellers. Gosh! It involves too much of moving cities, towns, and villages. You are smeared with dirt and lost at times. Most of the travellers crib about packing. Yet, life is a great teacher. Travel hacks are one of the best things learned from the experiences. Solo travelling is a topper on the bucket list of people, be it men or women. Women solo travellers have increased in number with the passing by years. Being generous, women tend to pack insanely for their trips. 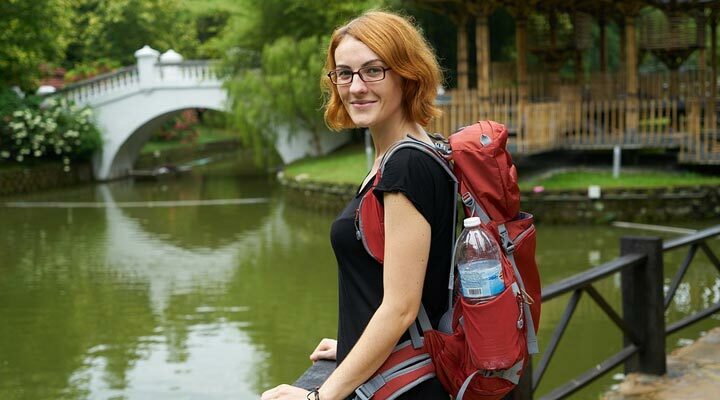 To solve the issue of unnecessary travel load, there are some of the unique essential travel items recommended for the solo women travellers across the world. It is very essential to choose your wardrobe wisely during travel, especially when you are travelling alone. You must do research about the place you are visiting, climatic conditions and place of accommodation. When you are travelling to a tropical region such as Bora Bora, you shouldn’t be carrying warm clothes burdening your luggage. Depending on the type of climate and region, the luggage should be customized. For women travellers to the tropical regions, tank tops and bottoms are a must-have in the luggage. It is recommended to avoid denims during a visit to humid regions. Skirts, cotton pants, and dresses can be packed, which keeps you well equipped for conservative environments. A pair of flip-flop, running shoes, loads of under garments and cotton socks are some of the travel essentials. For cold climate, thermal shirts, woollen underwear, scarf, thick socks and sweater dresses are essential travel accessories. Apart from the usual travel essentials, there are various other unique essential travel items recommended such as menstrual cups, travel bras, quick-drying underwear, packing cubes and others. Compression bags or Gobi roll are the one of the useful travel items for women. These bags help in organizing the wardrobe in a better fashion, increasing storage space for extra luggage or extra-shopping during vacations. A large Swiss Army knife is not usually allowed during security checks. It is recommended to purchase a small penknife or smaller version of Swiss Army Knife. It is termed as one of the unique essential travel items for solo women travellers across the globe. Travel line serve helpful for drying clothes during travel. It helps in saving the laundry cost, where laundry is expensive such as Europe, North America, and Oceania. Travel line is one of the most unique essential travel items when visiting Africa, as the laundry is almost non-existent for travellers. It is one of the best essential travel kits for women. It helps in using toiletries in a shared and unhygienic washroom. For women who sweat profusely, this is the best travel hack recommended. It helps in protecting clothes from stains and body odour. Off late, these disposable underarm sweat pads have been listed as unique essential travel items for every traveller. Travel bottles containing moisturizer, shampoo, body wash and liquid soap are essentials required for every women traveller. Refillable travel bottles can be used for saving space and can be refilled at the hotels whenever required. Facial wipe is one of the useful travel items for women. It helps in energizing the skin during a pit stop for a longer duration. Facial wipes can also be used as make-up remover during trips. During a journey, the face is one which suffers a lot with the climate change. Skin care is one of the priorities of women, which brings this blackhead removal strips into the travel kit. These strips help in pore-cleaning during travel, serving as one of the unique essential travel items. Sarong is one of the easiest clothing available for women, which suits temples as well as beach look during the travel. The razor refills are the best essential travel kit for women. Venus Razor Refills helps in minimizing the trouble of looking out for a salon during travel. These razors can be used for bikini-line if required for a quick date during travel. Apart from the usual travel essentials, there are other travel items recommended for the solo women travellers. During your travel, you might come across situations such as excessive vaginal discharge, irritation during urination, rashes and menstrual cycle. However, it is very essential to be well-equipped to handle the crisis. Pee buddy is a portable and disposable female urinating device, which makes urinating in public places easier. It helps in reducing urinary tract infections in females. The first aid kid must include all the necessary medicines administered by the person. Bandages, dressings, and tools supplies should be added to the travel kit. There are customized travel first aid kits available on the e-commerce websites. Birth control pills should be carried by the solo women traveller to avoid unnecessary health issues. Female condoms are one of the best essential travel kits for women travellers, as hook-ups and dates are inevitable. It is always better to be prepared for accidents and coincidences during travel. The use of public toilets and hostel rooms often led to infections. Vaginal wash is one of the unique essential travel items recommended for women travellers. There are vaginal wash available for travel kits in the form of small pouches, serving handy in the wallet or toiletry bag. Solo women travellers plan their trips based on two things majorly, one being the leaves approved and second, their menstrual cycle dates. Tampons and menstrual cups are useful travel item for women, which can help in controlling heavy blood flow. Diva cups are reusable menstrual cups for trips. There are countries such as China where tampons are unavailable. You can travel with ease with a well-packed and light weight luggage. These travel items would not only help you tackle the crisis, but it will also serve helpful for fellow female travellers. For instance, in one of the vacation with my best friend, we went double dating. With the crisis ahead, the female condom in my travel kit help in securing my best friend. Isn’t that amazing! Jokes apart, it is very necessary to plan your travel kit along with your travel plan. I’ve never heard of these armpit pads but wow what a must have item! I travel so much so I’m going to get some of these! Such important packing items for women! Great compilation. I must admit I was not aware of the armpit pads. Bless the soul who designed it. Great list! I’ve never seen the armpit pads!